This post is for those that have moved past the stage of researching Genetically Modified (GM) crops are are searching for ways to feed their animals food sources that do not contain any GMO’s. Although contamination is making that hard to do – it’s worth trying! In specific, diet for a dairy cow will be the main focus, but many of these options can be put to good use for other animals as well. Note: This article is referencing US GMO approval, not other countries. Other country information IS AVAILABLE in the reference section, below! Here’s a good recent article: GMO or non-GMO? Which seed will you purchase next year? chickens are free-ranged, supplemented whole grains (barley is working well for us these days) soaked in fresh milk for 24 hours. in winter we try to find the highest quality hay. The best hay can supply a cow with most, if not all of her nutritional needs (some grain for early-lactation dairy cows is often still necessary to meet energy needs beyond what hay provides). You’ll save on vet bills too by not having sick animals as often: Grain can easily cause acidosis, a serious digestive system condition that affects the cows in many ways and increases her chances of becoming sick from pathogenic bacteria. An exception to the grass-fed rule is that most dairy cows and chickens really do need some extra energy. I have seen a few cows that could do OK on a zero grain diet, but those types of cows are hard to come by. So, long-term, breed your gals for strength and sustenance. Ask around to find out which bulls will take a needy cow and give you an easy keeping calf. Then breed up your herd. There’s good money in selling these offspring, too! Cheapest is whole grain you mill and mix yourself. More expensive is prepared mixed grain. Most organic grain I’ve see in in a powdery form. If feeding grain in ground/powdered form, mixing with some molasses or ACV (for cows) & milk (for the chickens or pigs) makes the grain much more palatable. Be sure to keep access to loose salt and minerals suitable to your location and species if you are not feeding a prepared grain mix (that contains a mix of minerals)! A fresh cow really does do well when given soaked beet pulp. Commercial beets are laden with pesticides and almost all are GM. You’re options are to either not feed beets or find a safe source. I’ve heard of an organic beet pulp being sold, but haven’t seen it locally. We do feed beet pulp, so we make our own (click for instructions how to grow and make your own). We also feed OAT HAY as a substitute to beet pulp which is excellent for helping maintain body condition and rumen function. Side note, we are choosing with our bees to not feed them any GM or non-organic sugar if possible (they’ll get their own honey primarily, organic or cane sugar if necessary). Cows love a little sweetness with their grain, and a constipated cow can be cleaned out by feeding molasses water (a plugged up fresh cow is a bad thing!). Molasses is again, often from sugar beets. There are organic molasses options available at some feed stores. You can also try to purchase sugar cane (vs sugar beet) products, if their source is noted on the ingredients list. Many people love to use ACV for their animals and now Washington has GM non-browning apples. (Sadness!) Again, back to the trusty apple trees – vinegar is essentially a free product for us and ACV is super easy to make (click here to see how!) We recently purchased Wickson and Golden Russet cider apples and have high hopes for further improving the taste of our cider! 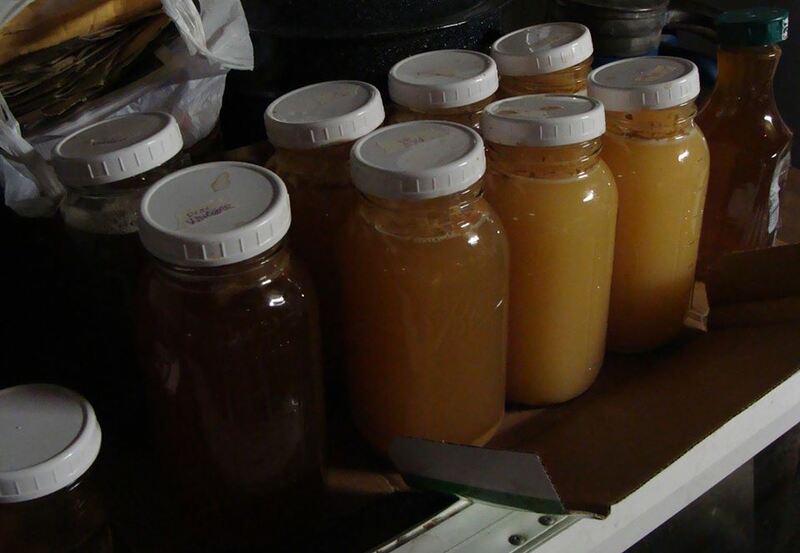 Brewing apple and pear vinegar – in the early stage! Oh, wait, we don’t have genetically modified water yet … DO WE? My response to them in this specific situation is that they must be in favor of GMO’s if they are not against them. NOT because I want the government regulating one more thing, but because we DON’T have the independent ability to say, “I am not going to participate.” Genetically Modified crops DO pollinate with other crops – and if your crops are contaminated, YOU are held liable! Shouldn’t my farm have the right to not become genetically modified because of cross-pollination? Regardless of government, each farmer has the ability to say “NO!” to planting GMO crops. I applaud you if you are one!